The Vedas are the foremost record of great advance made first ever by humanity since its awareness of the physical world around and the metaphysical element pervading it althrough. The composition of Vedas could have been possible only after the humans had developed the language as the means of their commu- nication and defined it into the components of phonemes (vocalic and consonantal), and morphemes (i.e. root + suffix combinations). 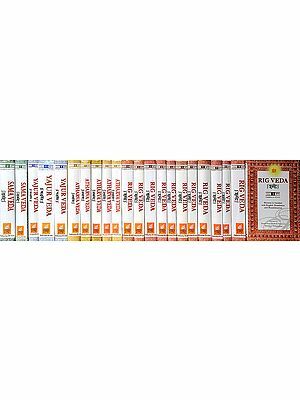 We have reference in the Vedas themselves that prior to the compositions of Vedic hymns, the intellectual defined the crude from of language into the possible combination of root + suffix. daivim vacamayajanta devastam visvarupam pasavo vadanti. ‘The scholars sacrificed for standardization of language, which was spoken earlier in many forms of dialects by the then illiterates in the society? In fact yajna was taken by the Vedic Scholiasts to mean operation. This yajna/operation was carried out always to make improvement upon the earlier situation and so it was called as the noblest act. The Scholars carried out the operation/yajna (chandas), i.e. composition of hymns by means of first operation i.e. by means of standardized language. The literary couplets composed during second operation/yajna became the first ever dharmas i.e. literary compositions in the literary history of mankind. The seers composed these chandas after appreciation of the properties of the luminous matter (naka) which were already approved by the earlier thinkers’. In fact all the mysteries unravelled by the seers regarding the luminous matter were pronounced in the forms of literary couplets, or chandas. These couplets or chandas were regarded as dharmas. ‘There were rsis to whom was revealed dharma’. Thus to sum up, it can be maintained that as a result of the second great operation, huge number of couplets / chandas were composed by various enlightened rsis on various aspects of scientific truths unravelled by them regarding psychological matter (consciousness) pervading the physical matter (electrons) which is present in the whole material creation / universe in three forms. l. In latent form present as agni on the earth. 2. In violent form as vayu and indra, a dominating factor in mid- sphere. Thus the couplets pronounced regarding the latent form of physical matter, i.e. agni and its co-deities dominant in terrestrial sphere were christened as reds. The couplets produced on vayu, indra and their co-deities were named as yajusas and the couplets on surva and its allied subjects were called as samans. The later Vedic scholars have alluded to this fact as under. dudoha yajna siddhyartham rgyajuh samalaksanam. 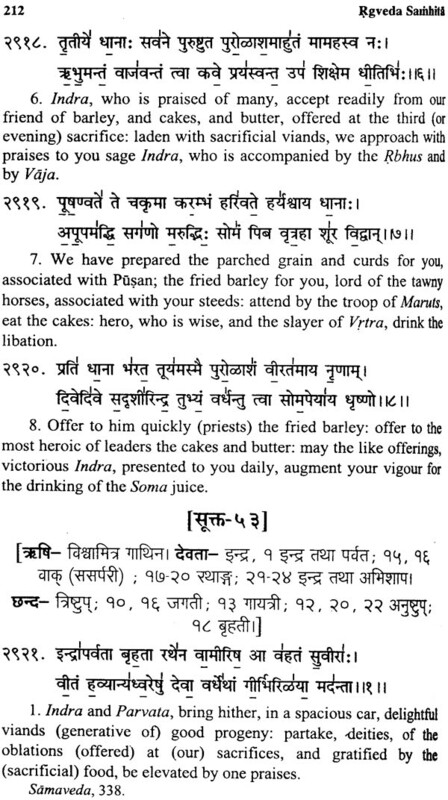 ‘To make the great operation a success, three types of brahmas (couplets) were derived. From agni were derived reds, from vayu, yajusas and from surya, samans. Here brahma signifies mantra, this is why, brahmacari was meant for the person who undertook the study of Vedas. ‘On account of the three forms of hot matter (tapta) three Vedas, or couplets of knowledge came into being. On account of agni came into being couplets called reds, compiled as Rgveda; on account of vayu, came into being couplets called yajusas, compiled as Yajurveda and on account of surya came into being samans compiled as Samaveda. The earlier classification of literary couplets in Rk Sama and Yaju was though done on the basis of their subject matter. The presently available compilation of Samhitas as Rgveda, Yajurveda, Samaveda and Atharvaveda does not seem to substantiate the above mentioned basis. The extant Samhitas have neither been compiled in view of rsis nor deities. Rather the literary style seems to underline their compilation. Rk Samhita consists of couplets embodying the readings of prayer, benediction, praise, etc. (rgarcani); Yajurveda consists of couplets read like prose (yatpraslistapathitam Tata yajuh) and Samaveda consists of couplets (reds) set to the tune of music (gitisu samakhya). Atharvaveda seems to have couplets of miscellaneous nature. 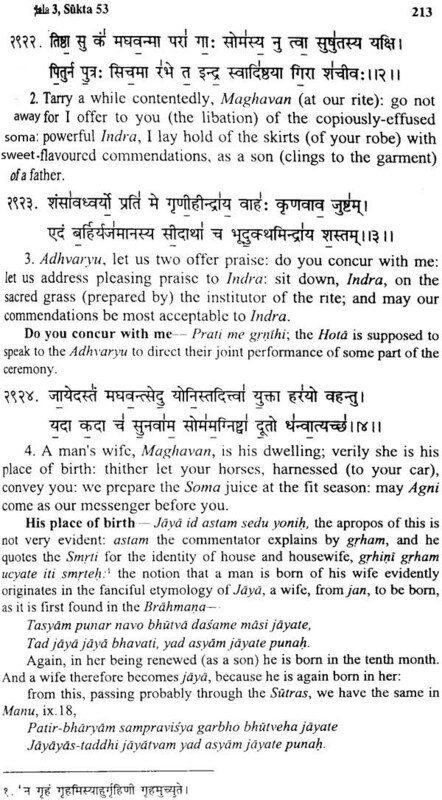 While etymolizing Adhvaryu, Yaska clarifies that Adhvaryu is the priest who deals with the Yajnas. In fact this concept behind the act of Adhvaryu didn't develop out of Yaska's imagination. But ranging from the Vedic period itself the demarcation of duties of various priests had taken place. Yaska also takes the help of a red while describing the various duties of various priests. Yajnasya matram vimimita eko adhvaryuh. Thus from the foregoing discussion it is crystal clear that Yajurveda was mainly associated with Yajnas. The derivation of Yaju from yaj ‘to perform sacrifice’ also bear out testimony of the above concept. Moreover an etymology of Yaju is discernible in S.Br.10.3.5. 1-2 as ‘yat+ju’ which also suggests the concept of ‘juhoti’ or ‘to perform sacrifice’. ‘agnyadidevatamuddisya yo dravyasya purodasadeh tyaga utsargah sa yajnah. Tenaitat siddham devatoddesyena dravyatyago yago yajanamistiriti paryayah. Now we may discuss here under the origin of rituals.